I needed to make cookies STAT for my son’s last-day-of-school-party….uh, thanks for the day before notice, son! I was browsing my “Best of the Best of Utah” cookbook I got from my mother-in-law one year. I wanted something other than standard chocolate chip cookies. 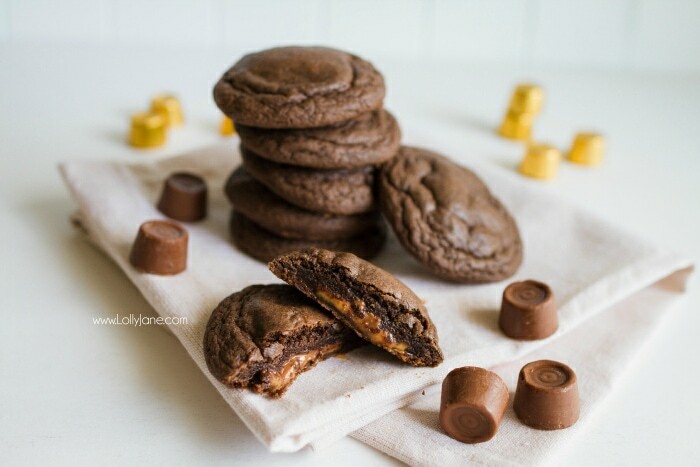 I came across a recipe called “Crazy Chocolate Caramel Cookies” and started drooling. 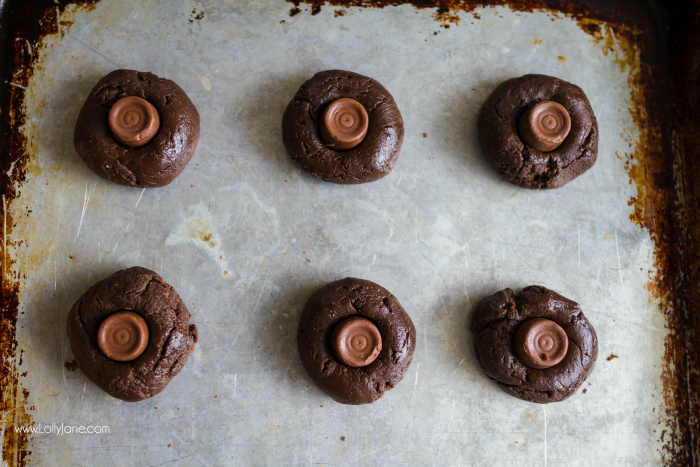 ROLO cookie recipe!? Where had this been all my life?? They’re chocolate cake mix cookies with Rolo’s inside, brilliant. 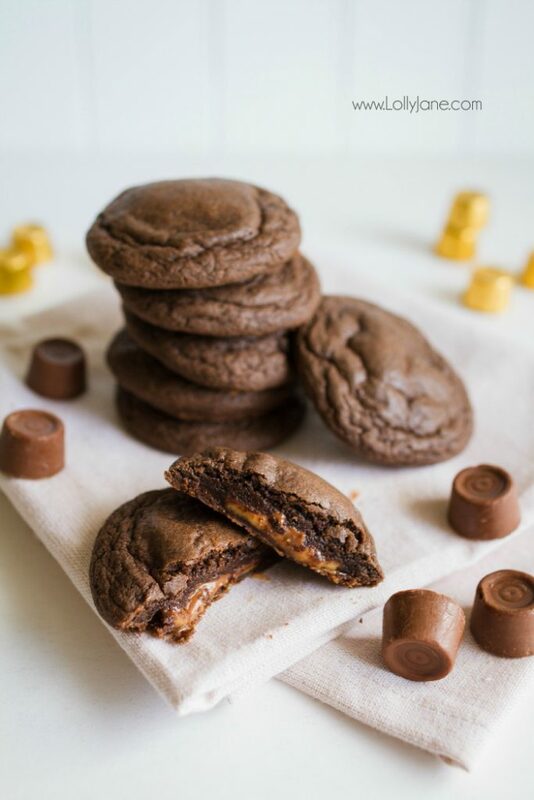 Love this easy Rolo Cookies Recipe, it’s amazing!! Combine cake mix, oil and eggs. Blend well. 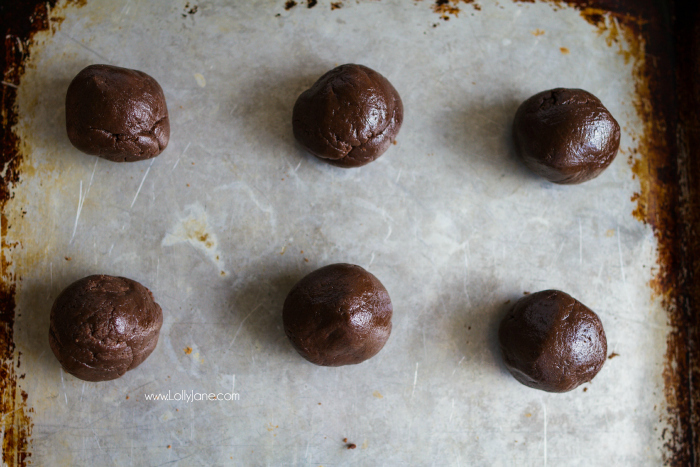 Place a Rolo in the center of a piece of cookie dough, fold the dough in a ball around the Rolo. Note: You may need to use some oil on your hands as the dough is sticky. 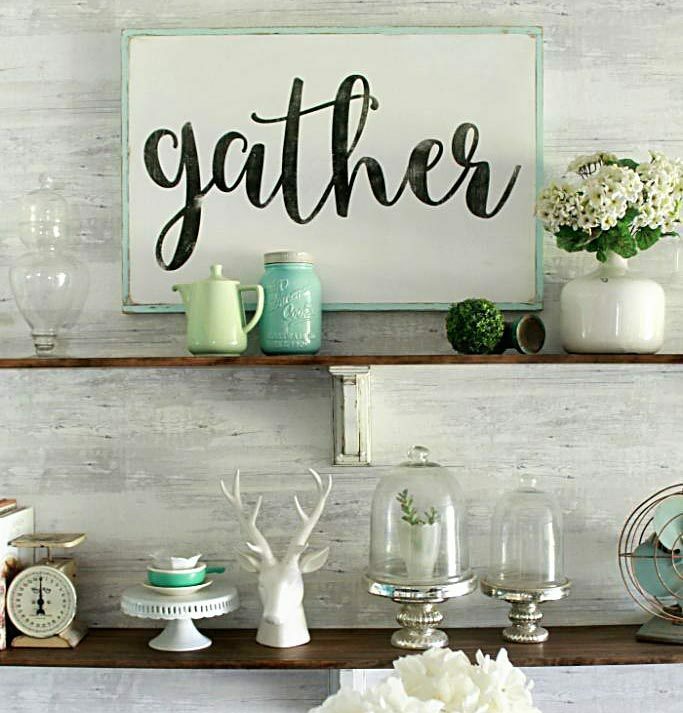 Place on a greased cookie sheet 2″ apart. Cool 1 minute and remove from cookie sheet. *Makes 2 dozen cookies. 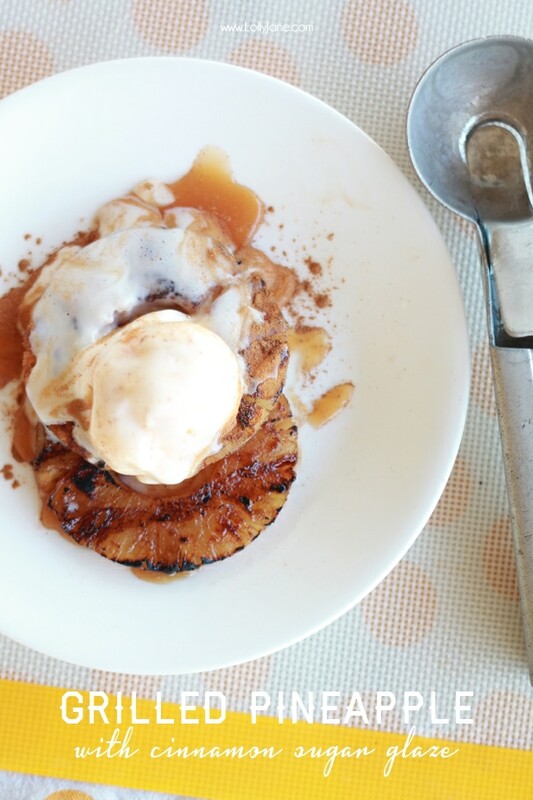 Love this recipe….I’ll be stocking up and freezing Rolo’s for potlucks, get togethers, etc. Look how fun these are to make! 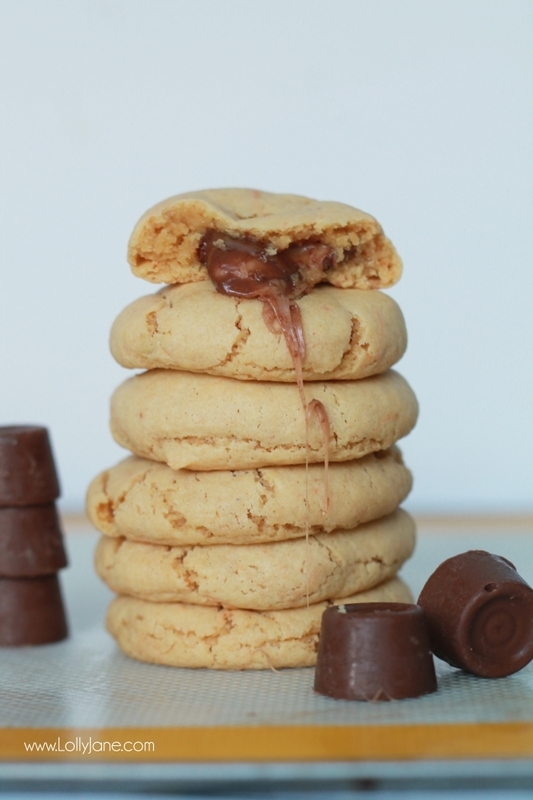 Check out our other yummy recipes like our peanut butter Rolo cookies, just 5 ingredients!! 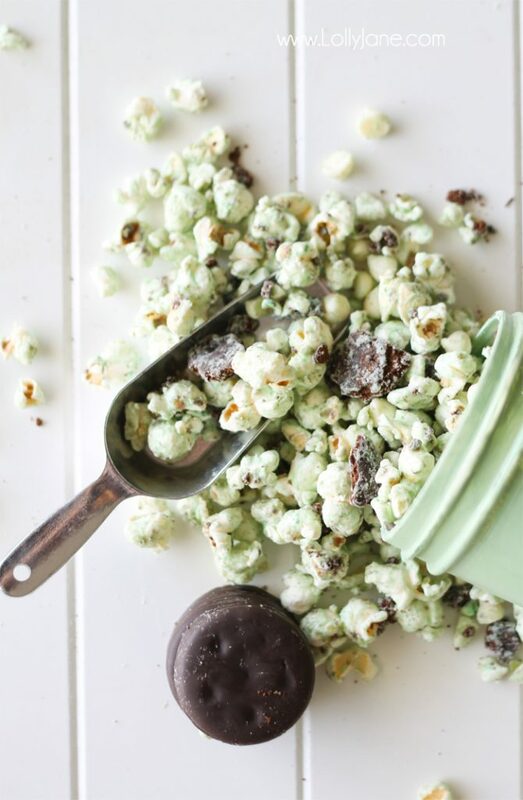 and our white chocolate Thin Mint popcorn, YUM!! PLUS check out all our many, many tutorials too! Subscribe to our RSS to keep up with our latest and greatest along with our FB and Twitter…we Insta daily too! Mmmmm … we made those a few months ago and they didn’t last long. So yummy! For real?! THESE LOOK DELICIOUS. and with your gorgeous pics I seriously can taste them already. yum! Wow! Those look incredible. I need to forget I ever saw this! Coming out of hiding…I was MIA for a little while. Glad to be back. I joined your link party. I have a giveaway posted on my blog, but I linked to my review in the giveaway (a stenciling project). Thanks for the link party! Ohhh. Myyy. Worrd. Heaven? I think yes! Pinning these for sure! Yummmmm, my mouth is watering!! Good luck storing your rolos in the freezer 😀 they wouldn’t last here. these are fantastic, i love cookies with a surprise 🙂 great idea for a school break up party with a sneaky treat! Hello and congrats on your lovely new space! 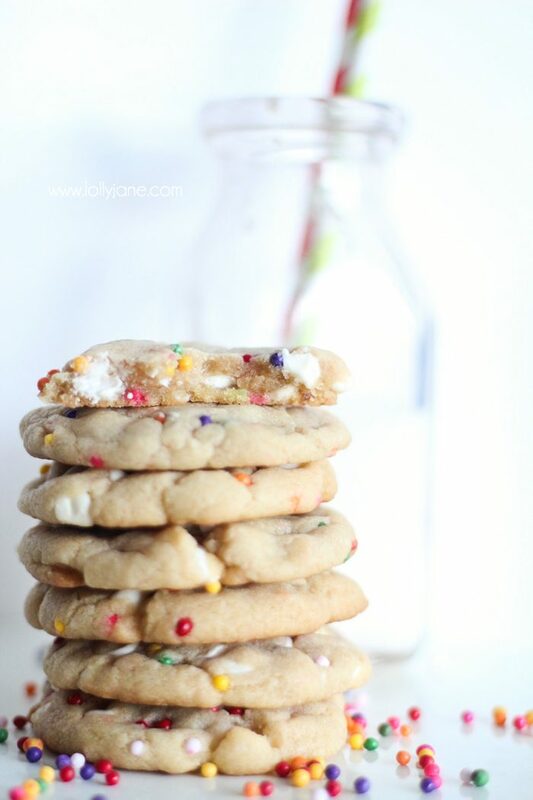 oh my goodness…baking these ASAP! Did you linked up this babies to my party? They deserve a sticker for sure. These look amazing! I must make these for my man for Father’s Day. Thank you for helping me earn the title of BEST WIFE EVER! I am so trying this recipe this week, I love rolos!! YUM!!!!! Can’t wait to make these!! What a great idea! You could put just about any mini=candy bar inside, too. Like Snickers! or Reese’s. Wow this is a quicker way than my rolo recipe! I’m for sure going to try it. Thanks! I made these one year for a cookie exchange but did NOT read the directions entirely. I bought those hard caramels and made them and they were delicious. HOWEVER, when they cooled off the middle was hard as a rock! I had no time to remake so I had to include a waiver that no one would sue me if they had to make a trip to the dentist for a broken tooth. We warmed them up with about 10 seconds on the microwave and saved our choppers! Haha… oh, I mean OOPS! Darn it! Yes, ROLO’s are the way to go… smooth creamy caramel that doesn’t harden! (; Thanks for sharing your oops!! These look fantastic! And super easy! Can they also be made with a vanilla cake mix? Yes ma’am! Any type of cake mix! Mmmm! We tried this recipe and our batter was sticky, wouldn’t even release from mixer beaters. Have we done anything wrong? Hi Madison! We’ve never had a problem with it :/ So sorry! Just mix the dry cake mix with the wet ingredients and it should work!! Haha Georgine, that made me chuckle! 😀 Thanks for the tip!! I wouldn’t bother with a mixer. I got in there with my hands after I did what I could with my spoon. My batter was more like a loose sugar cookie dough. Are you sure you used the right amount of oil? I followed the box directions! Mine’s been perfect everytime..so yummers! I love these! Have you had luck freezing them? Any tips on how to wrap them for freezing or is that unnecessary? Thanks for the recipe. To those who have tried this: Wouldn’t they taste more cakey than cookie-y?? If not I’m all over these! Can you use any chocolate cake mix or just the one you have above? Attempted to make these and learned that Devil’s Cake does NOT equal chocolate cake!!! Ended up with a lot of runny cookies… Added some flour, but the bottoms weren’t thick enough! Also the dough was wwwaaayyyy too sticky to handle. 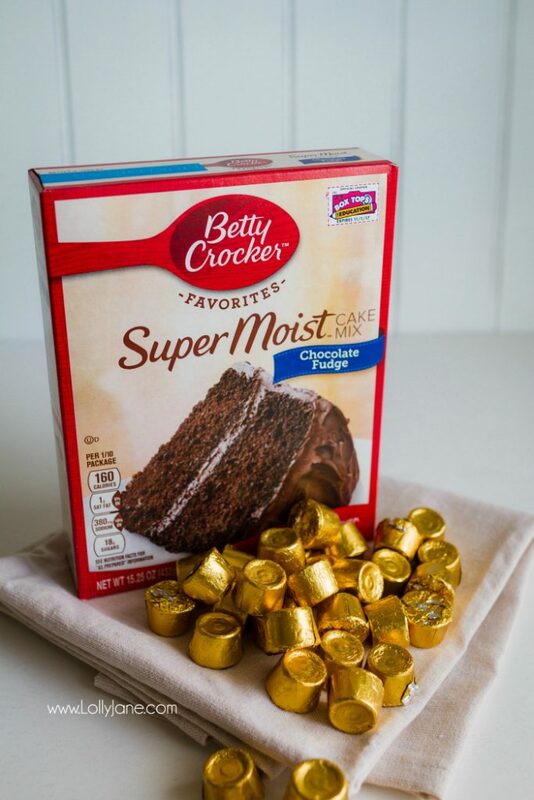 Want to try it the right way with chocolate cake mix. Would not recommend Devil’s cake mix. They were still pretty good though. Place on greased cookie sheet 2″ apart. This recipe was NOT easy. I have never in my life had to work with such sticky “cookie dough” before. I followed all the ingredients and instructions to a T and something still didn’t seem right. I looked back the recipe multiple times and couldnt figure out why the mixture was so sticky. Once I finally got the mixture rolled into balls (with great difficulty), I followed the the baking instructions. Once I took the cookies out and allowed them to cool, they were all completely stuck to the pan, despite the fact the instructions said to use an ungreased cookie sheet. Apologies for my rant but I was very disappointed and won’t be following this recipe again. Hi Joan! These make about 2 dozen cookies. So glad!! They are our favorite go-to! I bought devil’s food cake. Will that work or does it have to be the chocolate fudge one. Thanks! So I made these today. Was a hot mess. Super sticky so oiled my hands. Didn’t help much. To get 4 dozen at one inch size you can’t even get that much dough around a Rolo or do you have some mystical super small Rolo’s? Even after cooled they’re still soft and extremely moist cookies but taste good all the same. Got just under two dozen if I covered the Rolo’s per instructions. I’m late to the party! Do you freeze the rolos before you bake? Thanks! Welcome! Nope, room temp is fine 😉 Enjoy! Oh my gosh. Where have these recipes been my whole life? Super easy. The mix is like mushy sand. Roll a rolo into it, bake and enjoy! They look like soft baked cookies. I will be using variations of this recipe for Christmas cookie trays. Thanks for simplifying my life! Found this recipe for a last minute late night bake session for cookie exchange party. They’re in the oven now! They look delicious! Yay! 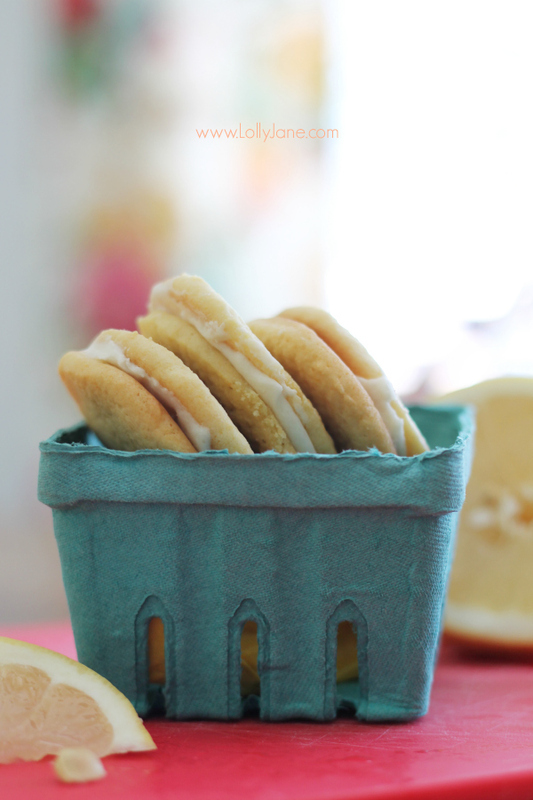 Hope you enjoyed them, the perfect fast cookie recipe!